Altitude: 400-1000 metres above sea level. 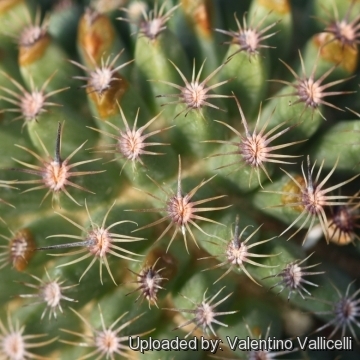 Habitat and ecology: It is an obbligate saxicole that grows on vertical cliffs in tropical deciduous forest together with Mammillaria carnea, Mammillaria sphacelata, Myrtillocactus geometrizans, Ferocactus recurvus, Pachycereus weberi and Echeveria laui. Due to their verticality, cliffs avoid sunlight at noon, providing a cool refuge during the hottest hours of the day. Living on the cliff may be costly because radiation is reduced but on steeper slopes plants find refreshment when the climate is hot. 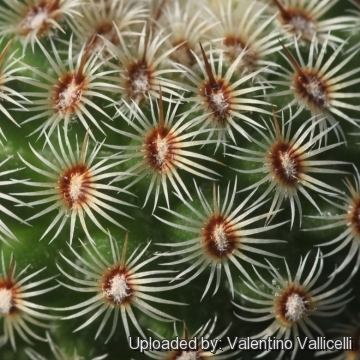 This may contribute to explain why cliff-dwellers have evolved in so many succulent-plant families. The seedlings only grow under the shade of nurse plants and establishment is very low. The populations are threatened by goat trampling and also climate change is a potential threat to the species. 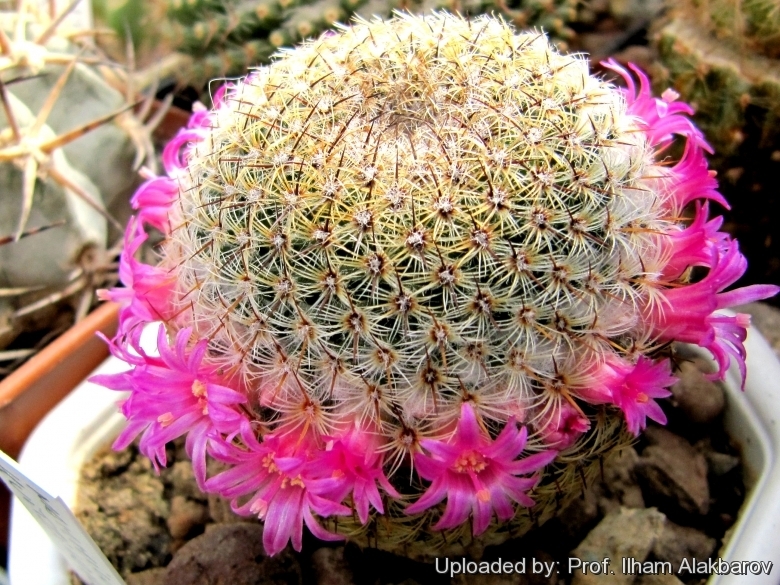 Description: Mammillaria huitzilopochtli is a solitary or slowly clumping cactus forming untidy clumps, up to 8 cm tall and 6 cm wide. Two subspecies are recognized, the nominate and ssp. niduliformis (A.B.Lau) Pilbeam. Stems: Dark green, at first spherical, later cylindric or club shaped, 8-15 cm high, 6-8 cm in diameter, apex slightly depressed. Tubercles: compressed on the sides, cylindrical to conical. The axil is filled by dense white wool in the flowering area. Radial spines: 15 to 30, dense, pectinated, held close to stem, glassy white, brown at base, up to 1.5-3,5 mm long, straight or slightly bent. 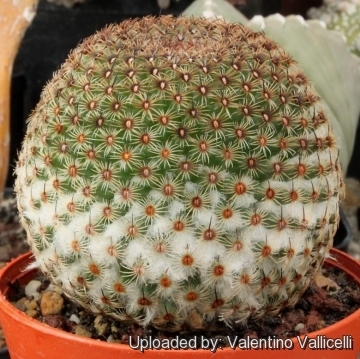 Central spines: Generally absent or sometime 1 erect fine acicular or awl-shaped, thicker at the base. Most of the clones have short, light grey spines 4-10 mm long. 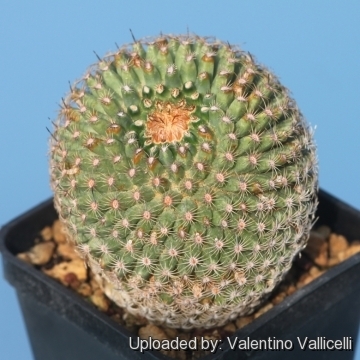 Occasionally, they have longer brown or black central spines (Up to 20 mm long). Flowers: Produces rings of bright pink to carmine, 12-15 mm long, 7-10 mm wide, often not opening widely. Stigmas carmine. Fruits: Red club-shaped to cylyndrical up to 15 mm long (frequently seedless in cultivation). Remarks: It will form pretty ring of beautiful pinkish red flowers at Xmas followed by a crown of little red fruit in May. 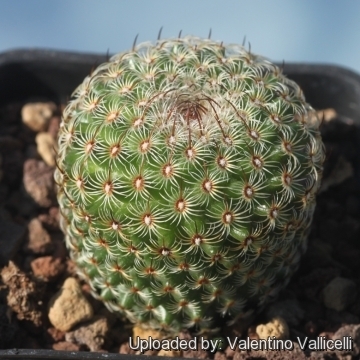 Mammillaria huitzilopochtli D.R.Hunt: (ssp. huitzilopochtli) has 0(-1) central spines and up to 30 radial spines. 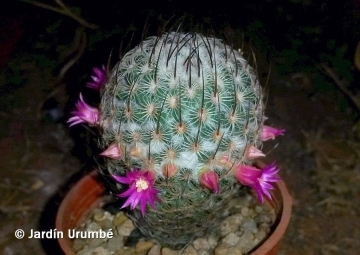 Mammillaria huitzilopochtli subs. niduliformis (A.B.Lau) Pilbeam: has 2-4 longer central spines and up to 22 radial spines per areole. 6) Arias, S., Valverde, T. & Zavala-Hurtado, A. 2013. 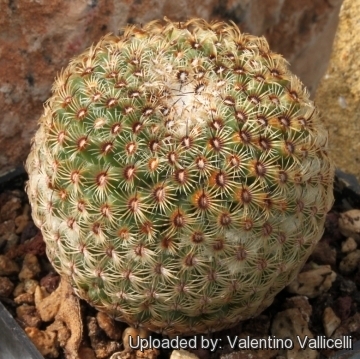 Mammillaria huitzilopochtli. In: IUCN 2013. "IUCN Red List of Threatened Species." Version 2013.2. <www.iucnredlist.org>. Downloaded on 07 March 2014. Cultivation and Propagation: It is a relatively rapid growing species. This is easily grown into clumps, but it does often have an irregular pattern of offsetting. Water regularly in summer, but do not overwater (Rot prone) Use pot with good drainage and a very porous potting media, keep dry in winter. Feed with a high potassium fertilizer in summer. 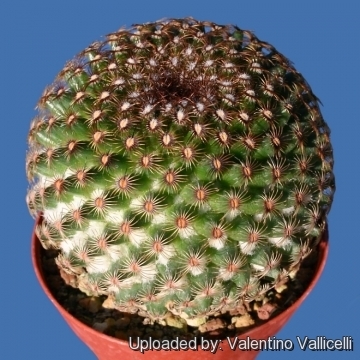 It is quite frost resistant if kept dry, hardy as low as -5° C. Outside full sun or afternoon shade, inside needs bright light, and some direct sun. Easily flowering. Most plants will offset readily, and clumps can be produced in a few years.